In 1985 the late Peter Flint, a member of the Bourne Society and the Croydon Airport Society, wrote his R.A.F. 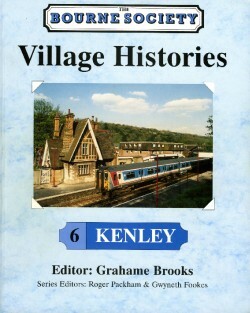 Kenley, subtitled The Story of the Royal Air Force Station 1917-1974. With a few alterations and additions, this narrative is condensed from Peter’s authoritative book. In 1914 Conway Jenkins had moved to ‘Glen Cottage’ in Hillbury Road, Whyteleafe. He had proved himself to be an efficient organiser with the Army Service Corps, and when someone was required to set up Aircraft Acceptance Parks he started work at Hendon. Jenkins rose rapidly to become Lieutenant-Colonel and Assistant Director of Aircraft Equipment, and when the search for further Acceptance Parks began, he exercised his local knowledge by appraising Kenley Common with its golf course wandering among spinneys and trees. The first that local people knew of the presence of an Acceptance Park to assemble and test aircraft entering service on their doorstep was when men of the Canadian Forestry Corps started felling trees and clearing scrub — a shock that they shared with Kenley Common’s Keeper. Public outcry, and questions in parliament, followed, but the land was taken under the Defence of the Realm Act. Public opinion became more acquiescent (especially in light of the bombing of London, Croydon and Purley), and work on the aerodrome that was to become No.7 Kenley Aircraft Acceptance Park began in early June 1917. Apart from the Common, the Royal Flying Corps also took over the adjoining New Barn Farm to the south and a substantial area of Waterhouse Farm where it joined Hayes Lane to the west. lt was in the fields along Hayes Lane that all the initial activity took place. The site mushroomed rapidly, until eventually 18 Bessonneaux hangars – the standard RFC portable hangar comprising a heavy canvas cover stretched over a buttressed wooden frame, together with over 70 bell tents, marquees and other portable buildings, were standing on a site that a few days earlier had been farmland. Within a matter of days, the first aeroplane was completed and tested. Continuing use of Hayes Lane by the public caused the RFC headaches, aggravated by an ever-increasing flow of sightseers. The problem was only solved after the introduction of bye-laws restricting its use to bona fide users, who were issued permits. The disadvantages of having virtually an aircraft factory thrust upon them soon became apparent to local residents. They complained about the noise, not only from the aircraft, but also from the heavy lorries running a shuttle service from the local railway stations at Upper Warlingham, Whyteleafe and Kenley transporting aircraft parts, and constant whirring of aero-engines run up on test. The matter was further aggravated by the construction of seven large permanent Belfast-type aircraft sheds, 170 ft x 160 ft, and ancillary buildings. The guiding hand in running the Acceptance Park was the Commanding Officer, Major Thom. He was followed by Major McCallum, a production specialist, who swiftly established a first-class, efficient unit. At this time, SE5s, Sopwith Camels and Sopwith Dolphins were produced. The now Brigadier-General Conway Jenkins was a frequent visitor, flying his own special BEZC, which he kept on the aerodrome. After America entered the war, an American Air Force unit came to Kenley to train as mechanics. One of its memorable moments was when it went on strike over the food – Australian rabbits that were rather ‘high’! Americans refused to eat them, but the British didn’t – they were just too hungry. Tea was usually hard biscuits and jam.